So Martin McGuinness and Queen Elizabeth II shook hands. I wonder if it was what they thought it would be like? Time will tell. Brian Hayes of Fine Gael called it a publicity stunt by the ‘failed Presidential candidate,’ a bit rich I thought coming from a government party whose candidate went around the country at the time of that election like a bloody old farmyard hen. He only got 6.4% of the first preference votes compared to 13.7% of McGuinness. Some would say he put politics before peace! I think this meeting has had a huge impact. Anyone of lesser stature than McGuinness within Sinn Féin and this would not be the case, even Gerry Adams. Alex Mackey laying a poppy wreath is one thing (a very big step at the time), but this is something that few thought they would ever see. There are a few questions that come to mind and one is, why didn’t Martin McGuinness meet Queen Elizabeth in Dublin last year? One reason could be that Queen Elizabeth II’s visit to the Republic was such an enormous event in itself that the significance of the McGuinness handshake would have been lost, so let’s not underestimate what happened in Belfast last week. Another question is, by not meeting Queen Elizabeth in Dublin did Sinn Féin misjudge or misread the ‘situation,’ and if they had met, would they have received some good publicity? No doubt that they would have. I think they were wide awake in the aftermath of what happened at the visit last May. They saw the reaction of the general public and realized the Ireland is changing. The focus of the people is changing too. I’m not too sure if they understand what the monarchy stands and stood for, but they could tell you the color of the dress Catherine, Prince William’s wife, wore at Wimbledon! In today’s world everything seems to revolve around ‘celebrity’, a word that doesn’t sit well with me. How do you define a celebrity nowadays? Probably somebody who is in the papers and news all the time somebody people are interested in reading about. In that sense Queen Elizabeth might fall into that category. If she doesn’t, what’s coming after her and what’s associated with her certainly does. The reason why last week’s meeting was such a big deal was that both are seen as symbols for their own people. I’d imagine that both parties had fences to jump to get to the point of meeting and shaking hands. So much has happened over the years, angry people on both sides who find it very hard to see past what happened to them, and you can’t blame them for that. But for things to move forward on the big picture these other issues had to be put to the side for the greater good. Put to the side, but certainly not forgotten. If Queen Elizabeth is seen as a symbol then in one sense history has repeated itself again. After the civil war here in Ireland, De Valera refused to take the Oath of allegiance of the King of England, therefore he could not take his seat in Parliament. As time went by he realized that the people wanted to be represented and by not actually being in parliament (even though he had won his seat), he was losing ground and might eventually lose his seat. In 1932, De Valera took the oath, but said that it was only a ‘symbol,’ only a piece of paper. One might ask what would have happened if he had taken it the first day, ach sin scéal eile (that’s another story). De Valera did pretty well as we know after that and the rest is actual history. 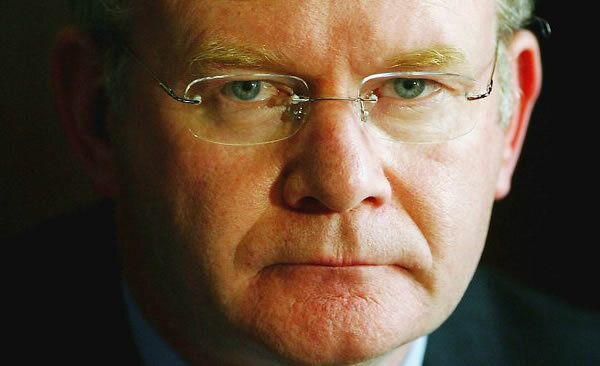 So, did McGuinness do the same as De Valera? He might have! Will he like De Valera go on to be Úachtarán na hÉireann (President of Ireland)? Time will tell.